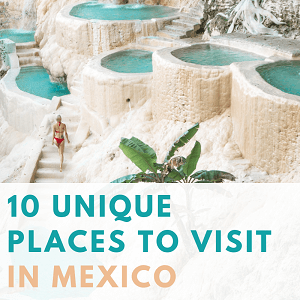 This year my husband Joel and I decided to do something crazy and head out on a 2-year long road trip through Central and South America. We were super excited for this trip but we had one problem- no transportation. We recently sold our converted Honda Element camper suv in order to get something bigger for the long trip. With a tiny budget and not a whole lot of money, we couldn’t afford to spend our entire savings on buying a decked out $100k+ camper van so instead we decided to put our own brains and hands to work and do our own awesome DIY custom camper van conversion. 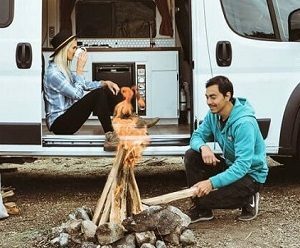 We found the perfect, slightly used Ram Promaster van for $20K and over the next 3 months converted the blank cargo van into a fully livable custom built camper for just under $3k in conversion cost. 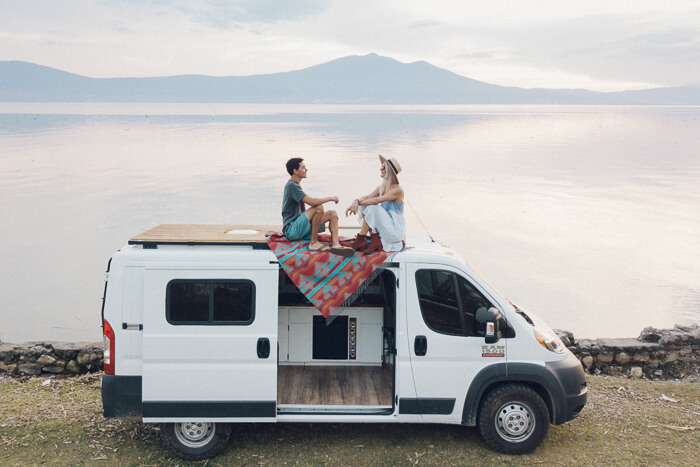 Our guide below covers exactly how we did our DIY camper conversion for anyone inspired to join the van life movement themselves on a low-cost budget. To make this Promaster camper van conversion guide easier to follow, we divided our how to guide into two parts. Part I will cover the conversion planning, layout design ideas and all of the prep work we did that’s not necessarily visible but make everything work. Part II will cover the construction of the finished product and any extras we added to make our van life travel on the road more comfortable. 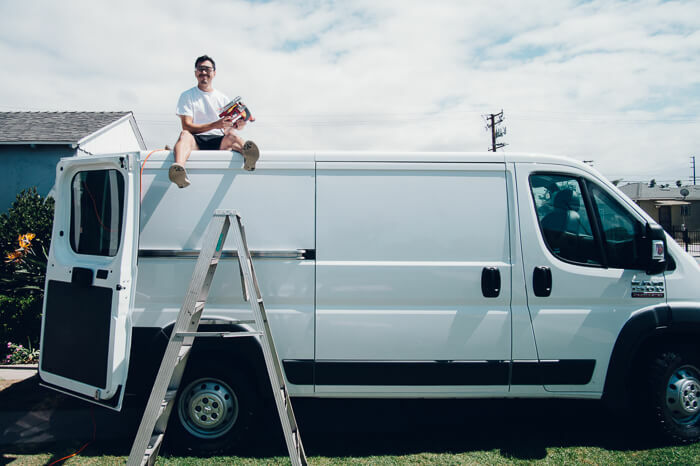 When we bought the Ram Promaster van it was an empty room on wheels so the first task of our van conversion process was to come up with some campervan conversion ideas. 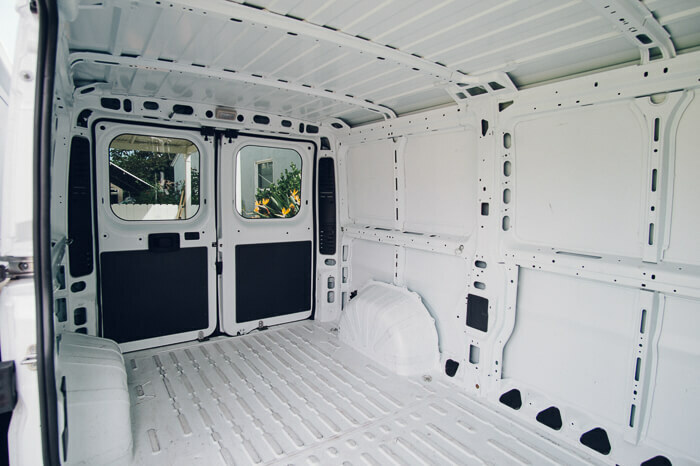 During our research, we couldn’t find any low-cost Ram Promaster conversion kits so we had to create our own customized layout and plan from scratch. After all, one of our main goals was to keep our van conversion cost as low as possible and we also liked the idea to have the freedom to modify anything in our van to make it look amazing and unique instead of using a generic kit. We had a basic idea that we wanted the kitchen to be in the front against the left wall and the bed in the back. Everything else we had to figure out as we built the van. 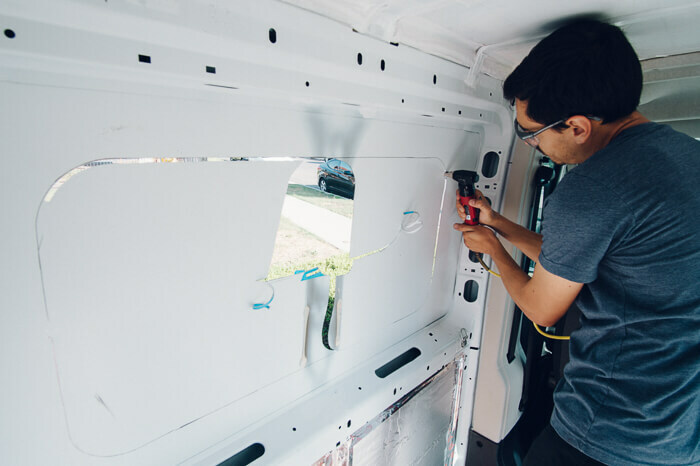 Before we started with any interior work, the first task was to cut out holes in the van for the windows and fan. This was actually one of the scariest tasks to do because if something went wrong in this step, the van would be ruined. Sounds fun, right? 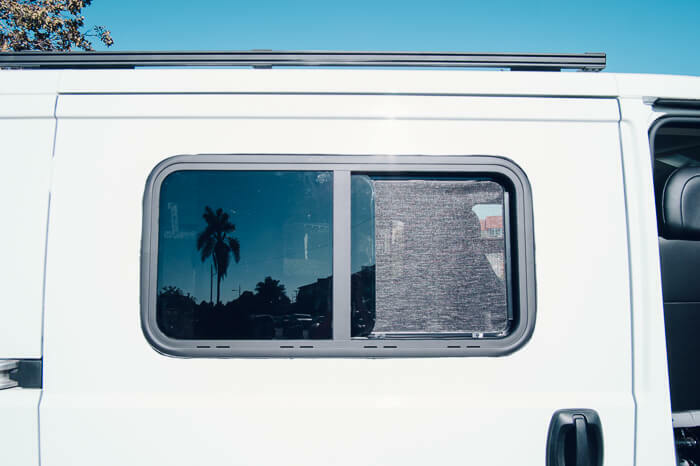 We wanted to install two sliding windows in our campervan to allow air in, add better vision and circulate air for cooking. We wanted to add one window on each side, one on the sliding door and one behind the driver’s seat. The sliding windows we chose came in medium size with screens to protect against bugs at night. We bought the windows from a local RV surplus store instead of going with the windows that are made specifically for Ram Promasters by CR Lawrence. 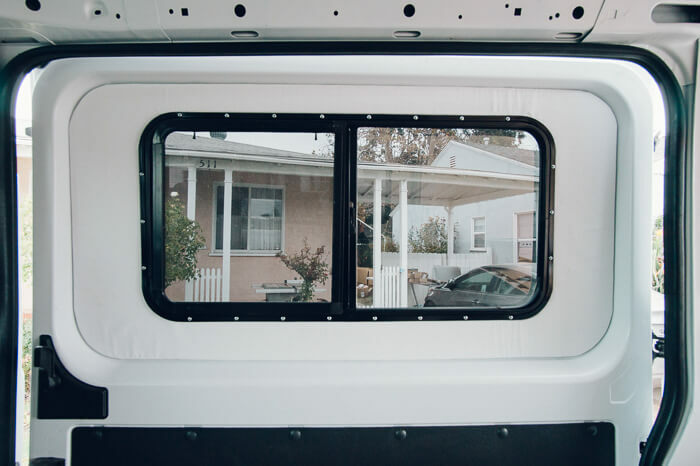 The RV surplus store windows cost only $30 each and came with screens and trim rings compared to the others that cost around $500 a piece. Besides cutting two holes for the windows, we also cut a hole in the roof for the fan. We decided to install the fan towards the back of the van above the bed to get better circulation as the air comes through the sliding windows in the middle of the van and out the fan in the back. 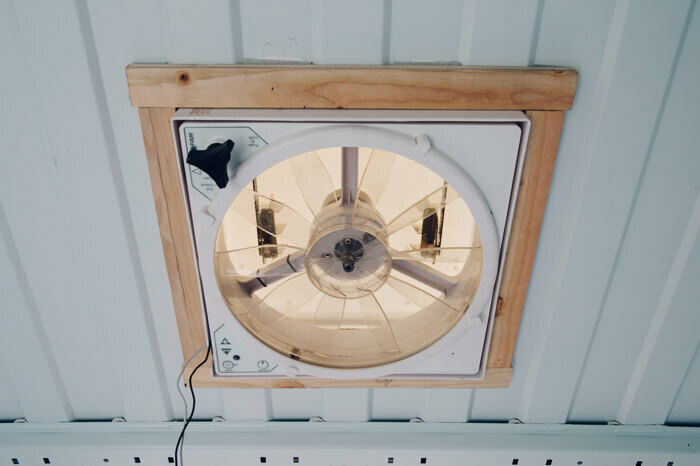 We used a MaxxAir RV roof fan with multiple speeds and a temperature sensor that can be set to automatically turn on the fan if the van gets too hot. We used a reciprocating saw to cut the hole for the fan and a hole puncher powered by compressed air to cut the window holes. The hole puncher left a smoother edge and less fine cuttings which tend to dig themselves into the paint and can cause tiny rust spots to appear. When installing the windows and fan, we touched up every cut edge with white paint so it wouldn’t rust and used this black butyl tape to seal everything off from water leaks. Cutting all three holes right after purchasing the van was intimidating at first, but after making the first cut it didn’t feel so scary after all. We are not electrical engineers so at first wiring seemed pretty intimidating to take on, but it turned out to be a lot simpler than we thought. 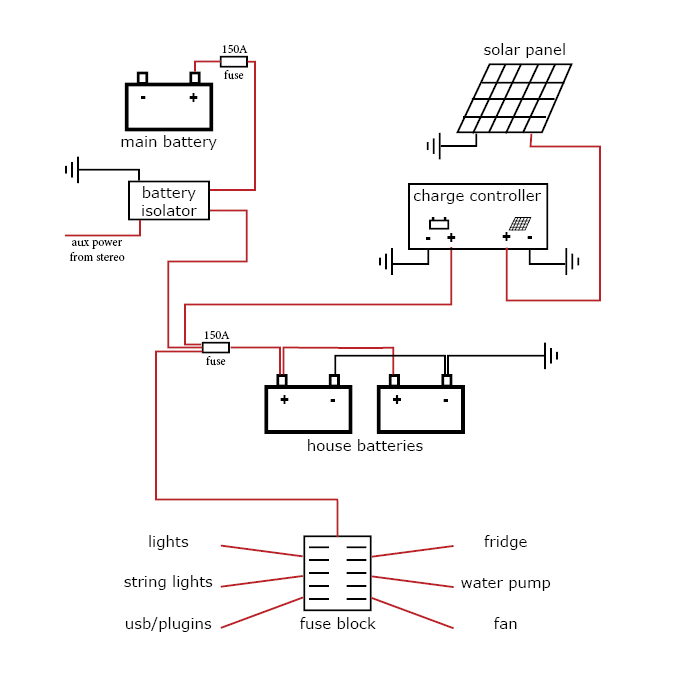 The first step is to draw a diagram of your electrical system. 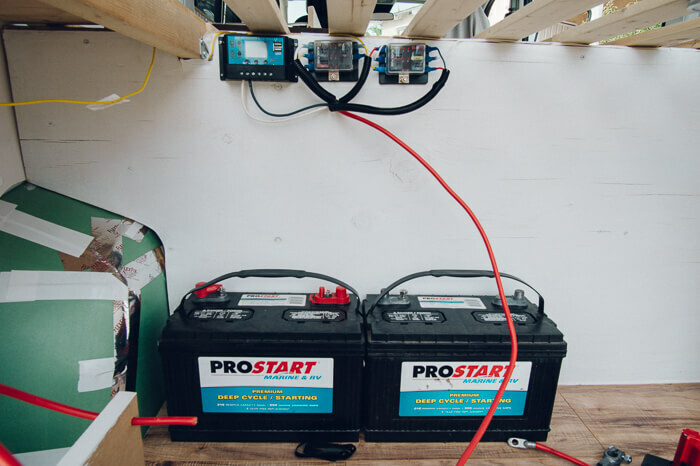 Our electrical system would include two deep-cycle Group 31 batteries (our “house” batteries) being charged by the car’s alternator while driving and a single solar panel on the roof. This system will easily power our LED lights, fridge, and water pump and have extra juice to charge our camera gear and computers. Instead of installing an expensive pure sine wave inverter to power up our electronics, we just bought car chargers for the few things that aren’t already powered from a USB drive. We used a battery isolator relay to charge the two house batteries from the car’s alternator while driving but disconnect them when the car is off, preventing us from discharging the main car battery and getting stranded in the middle of nowhere. This system worked great on our Honda Element conversion as long as we turned on the car for at least 15 minutes a day. The two house batteries were placed in the rear of the van between the rear wheel wells to distribute the weight to the back a bit. 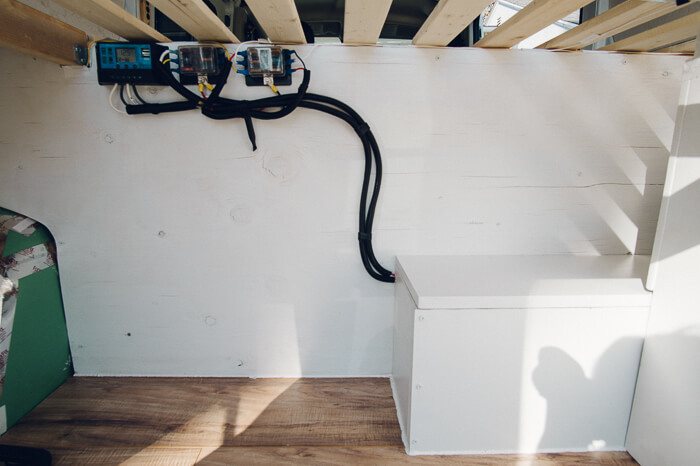 This location worked out great because we could easily place the fuse blocks and solar charge controller right above it and have easy access to them in case something goes wrong. For the batteries, we used two deep-cycle group 31 batteries from Pepboys that seem to always be on sale for around $50 each. 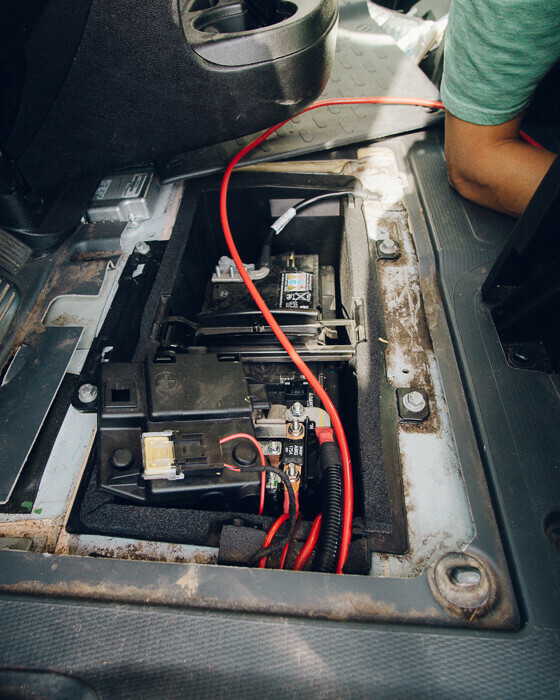 They are regular lead-acid batteries that could potentially release harmful gasses so they need to be in a sealed compartment. We created the sealed compartment using 3/4” plywood and high-density foam weatherstrip between the lid and the box, then used a ¾” hose vented to the outside right below the taillight. We used LED lighting all throughout because they are really efficient and don’t get hot like regular lights do. 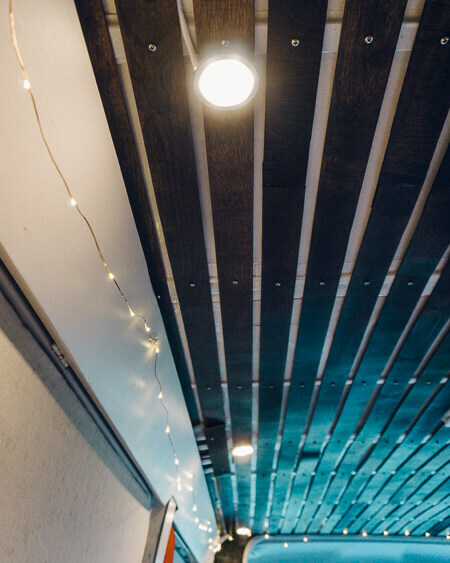 For when we need bright lights we installed five really efficient and bright LED puck lights on the ceiling and for when we want mood lighting we hung dimmable LED string lights all around the van. We used the 6th puck light under the bed in the rear storage compartment. 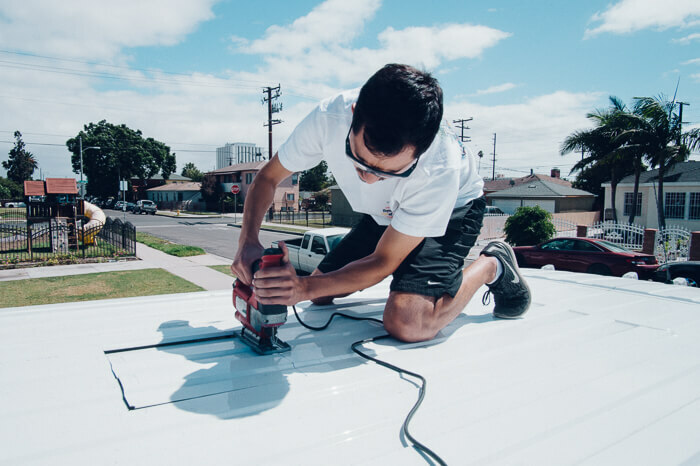 We also decided to add a solar panel on the roof of the van to help keep the batteries maintained on sunny days when we don’t do a lot of driving. Adding a solar panel is extremely easy and just needs two more components: a 12V solar panel and a $20 solar charge controller. 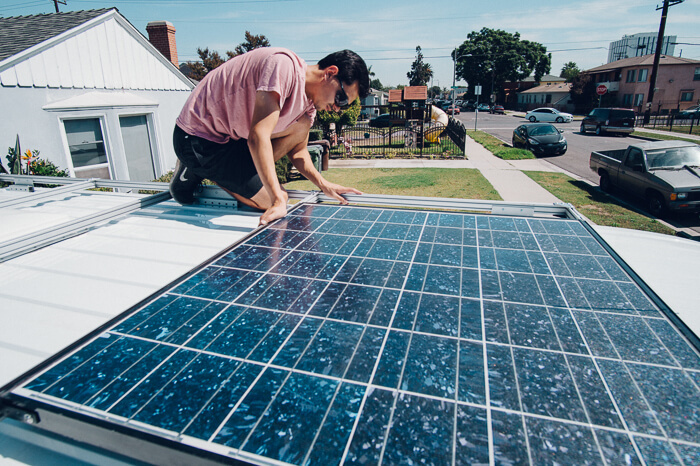 We found a used 145-watt solar panel for practically nothing on Craigslist and installed it on the roof, then drilled a small hole on the roof to run the two wires in and sealed it with a self-leveling sealant made especially for RV and van roofs. 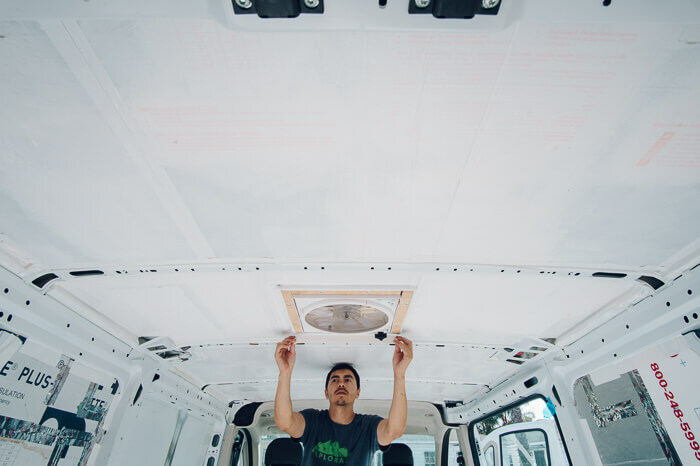 Before building up the interior of the Promaster van we wanted to install insulation to keep the van cooler in hot temperatures and warmer in cold temperatures. The only downside to rigid foam insulation is that it takes a while to cut and fix into every panel, but considering we don’t need to seal it off completely, it still takes less time than insulating with soft fiber insulation. We bought 1” and ½” insulation panels to use. We installed a double layer of 1” insulation on the bottom wall side panels and 1” insulation on the top back wall side panels to maximize space for sleeping at night. We then used foamboard adhesive to stick the insulation onto the walls and flexible duct tape to seal around the edges. For the space around the side windows, we cut out 1/2” insulation and covered it in white cloth. This gave the windows a really nice finished look that was much easier to make than paneling. On the ceiling, we installed 1/2“ insulation during our conversion to maximize standing room for cooking and hanging out. Since we put a large solar panel and roof rack on top of the van that would act as a constant shade we didn’t need thicker insulation in the ceiling anyway. 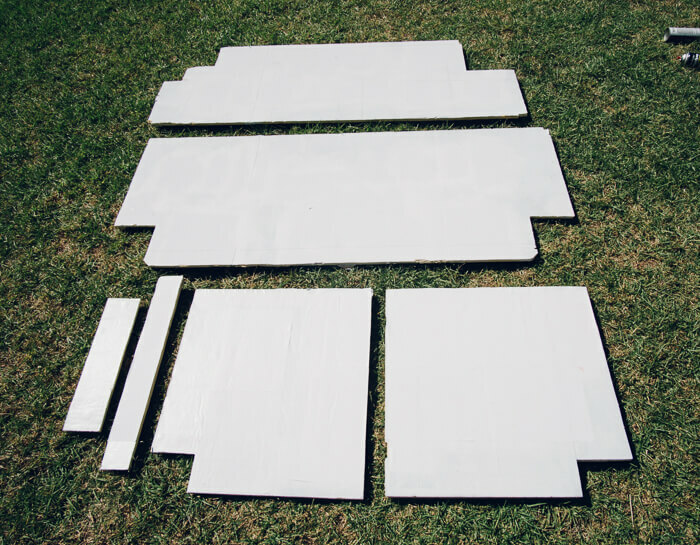 We painted all the ceiling insulation panels white because we were planning to install roof slats and we didn’t want any colors to peek through the slats. During the conversion’s insulation step we only sealed off the large panels and didn’t bother with the smaller crevices. On our previous SUV camper conversion we used a foam gap sealant to seal off all the small areas and ended up making a huge mess from the dripping sealant that was impossible to clean off. We found that sealing off every small area doesn’t add too much more insulation value if the big areas are sealed off properly already so we decided it was best to avoid all the hassle and mess. 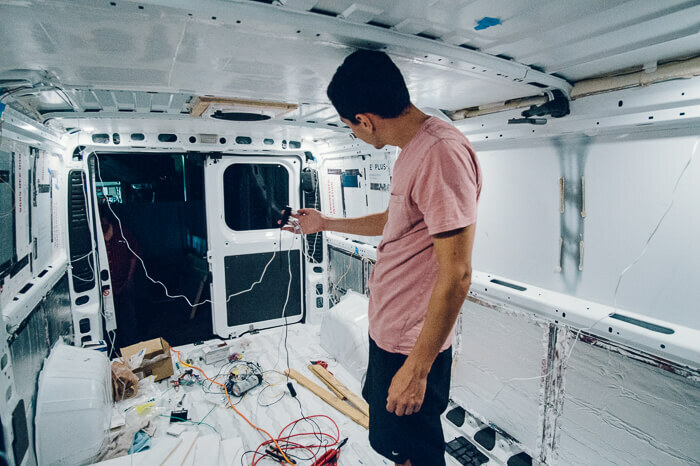 With the windows, fan, electrical, and insulation in place, we were ready to seal it all up and start working on building up the van interior and giving our Promaster conversion a finished customized look. 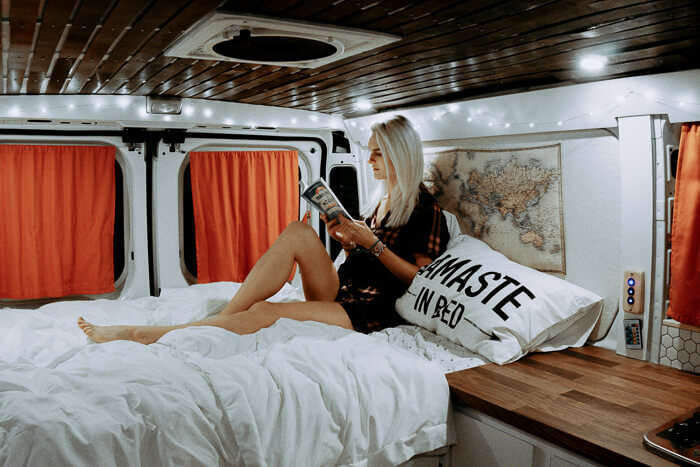 In Part 2 of our DIY homemade van conversion process, we will go over how we did the camper van’s interior build and all the extras that we added on to our conversion to make our van life more comfortable. Where did you get your windows for 30$??? I’ve looked everywhere and can’t seem to find them. We looked up “socal rv surplus store” on google and found a place called Walt’s RV in Corona, CA. I’m sure you can do a similar search wherever you live and find a similar place. It’s almost like an RV parts junkyard, they had thousands of windows to choose from that were old stock but never installed, in just about every style you can think of. Another great place to look is eBay, but they are a little more expensive after shipping. Super clean and simple, great stuff here! Thanks a bunch for sharing all of this. One question… how did you mount the 80/20 system up top? I’m doin this for sure. Did you drill into the roof or find a way to use the factory mounts? I do have a couple of questions; one, what isolator did you use and here did you locate it? Also, it looks like you didn’t put in any roof insulation? I’m assuming this was to save the standing height? And, would you put insulation in if you were to redo this build? We used this isolator which has worked out great. We put it under the van, right behind the van’s battery tray. We then used 6 gauge wiring to connect it all. Just make sure to add inline fuses to both sides of the cable in case there’s an issue anywhere along the wiring. Never mind the insulation questions?! I was reading too quickly on this part of the build page. SO, would you go with thicker insulation for energy sake if you were doing this again? Hi,Good job and thanks for your information. Just wonder , what model of promaster you had converted ? 2500 or 3500 ? And what is the wheel base of your van? It seems you don’t have any bathing facility in your van ? We have the 1500, 136″ promaster. We use this solar shower that we hang off the back of the roof rack and if we want privacy, we open both rear doors and hang a shower curtain in between with velcro. 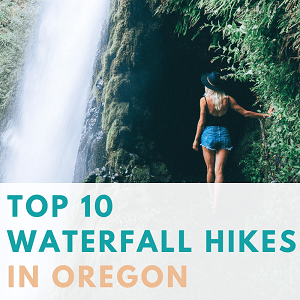 As for a toilet, we’ve never had any issues finding bathrooms while on the road or camping, but sometimes when stealth camping in a city it can be more tricky. There are many products people we’ve met use, like a folding toilet or this product for women that can be used with doggie bags. 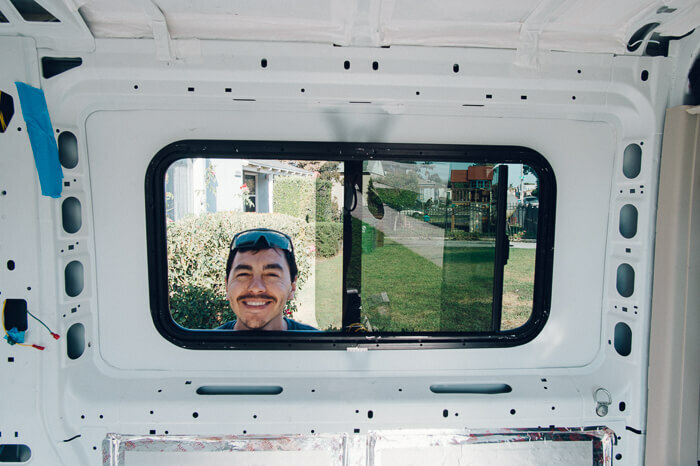 Hi 🙂 Building out the same van I was wondering what the dimensions of your bed are and if you are happy with the size? An amazing job on promaster! Best information I have found! I just bought one exactly like yours! So on the vinyl flooring have you used glue to hold it down? if so what! Thanks for sharing all the details of your build out! I know it took a lot of time. Please explain more about the install process for your battery vent. Pictures? Really nice looking van. I just bought a 2017 Promaster 1500 136″ Low Roof and was wondering how you did the roof platform. Did you attach the platform to a roof rack, or did you make your own rack? WOW. Good to see a complete walk through on Do It Yourself custom van conversion. You are now expert to do any RV/Camper Maintenance as well. Nice build! Wondering what your setup is for eating in the van as there appears to be no table or chairs. 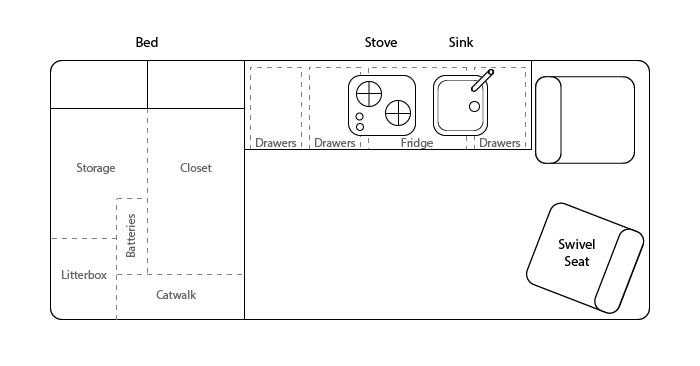 We cover the kitchen set up more in Part II of the post. We decided not to create a permanent table or chairs to leave more open space in the van so it doesn’t feel too cluttered. We have a foldable camping table and two foldable chairs that we use when we’re hanging out in camp spots. We also installed a swivel base on the passenger seat so one of us will turn that chair and sit/eat in it while one of us sits on the bed. 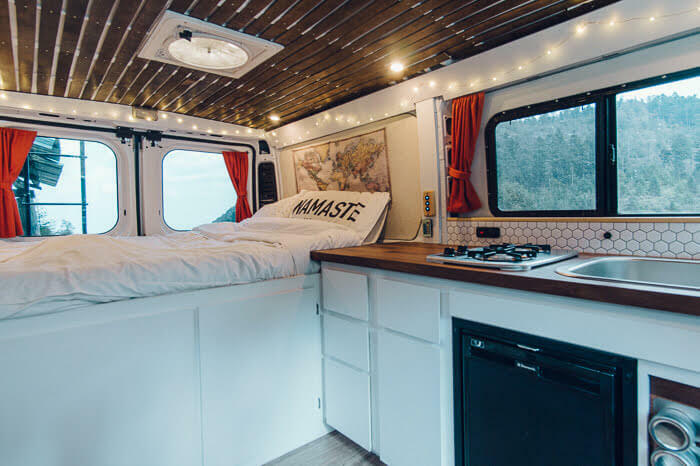 I’m looking to buy a Promaster and start a build, my question is have you ever regretted not getting a “high roof?” What were your thoughts on purchasing the standard van? Any input would be greatly appreciated.